This national 4-H film festival, in its 5th year, and the new “Map Your 4-H History, described above,” are examples of “Contemporary 4-H History:” programs which are now creating 4-H history. at FilmFest 4-H last month in St. Louis. Teenage filmmakers from 14 states exhibited 24 youth-produced films at this year’s FilmFest 4-H in St. Louis, June 14-17. Teens and leaders participated in the educational programs at the festival which included viewing on an actual theater screen and discussing the teen-produced films and joining in a series of workshops conducted by film industry professionals. Trish Seifried, animal trainer, taught youth how to prepare their own dog or cat for a starring role. The 24 films were pre-selected by judges to be viewed at the festival in five categories: Narrative, 4-H Promotional, Animation, “Voices of 4-H History,” and Documentary. The top three in each category were recognized during the program along with a vote for the audience favorite. In 2014, two Youth-Adult Partnership teams consisting of two teens and one adult participated in the “Voices of 4-H History” project for Hawaii. According to Joan Chong, HI Extension service, the teams from Kona and Maui participated in a basic training that covered interview questions and techniques, project design and management, pre-production, filming, and camera techniques. Because of training time constraints, the teams were also encouraged to connect with the local Community Access Television (CAT) to assist in editing and piecing the video together, and CAT was happy to help out. They offered classes in basic video production, camera operation, editing, lighting and studio production. Once the participants became certified producers at the CAT studios, the use of the television equipment and facilities were FREE! All the Youth-Adult Partnership teams needed to do was ask for help. When asked about the project, we found that youth participants not only learned video production but also gained knowledge about 4-H and the effect it has had on others. Teenage filmmakers from nine states exhibited 40 youth-produced films at the 2014 FilmFest 4-H in st. Louis, August 3-6. 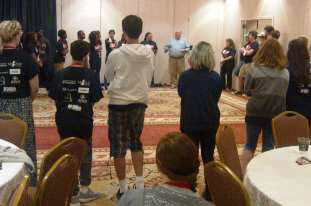 Sixty teens and leaders participated in the educational programs at the festival. Activities included viewing and discussing the teen-produced films and participating in a series of workshops conducted by film industry professionals. The topics included design, writing, casting, filming, lighting, sound, stunts, makeup, costuming, animation, control room operation, and remote satellite transmission. Emily Hagins, youngest Hollywood film director and writer, shared her Hollywood-based filmmaking insights from an unprecedented youth perspective. A visit to the nationally acclaimed “CoolFire Studios” in st. Louis where participants visited with professional directors, animation artists, sound producers and film producers as they worked in their studios. All across the country, teams of 4-H youth are working to produce films for presentation at 4-H FilmFest 2014 in St. Louis. “Voices of 4-H History” will be one of the categories that youth produced films will be competing in this August. Films submitted by July 1, 014 will be judged for exhibition during the FilmFest, August 3-6, 2014. 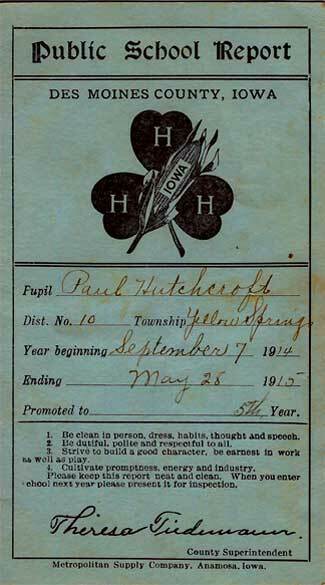 Report card of the father of a former National 4-H Foundation (now 4-H Council) staff member demonstrates the close tie between 4-H and One-Room schools. “Voices of 4-H History” captures memories of alumni, leaders, donors and others in audio/video records. That’s the oral “History Preservation” part. At the same time, having “Voices” as part of FilmFest 4-H 2014 is very current, so it’s the “Contemporary History” part. In the “Voices” bit, there’s a rather detailed explanation of how two MD counties are approaching the project; just consider it a “how-to” example if you’re not already involved. In the “FilmFest 4-H” part, you’ll find necessary details for this year’s national 4-H film festival and how you can participate. “Hands-On History” highlights 4-H Electricity projects and how you can bring awareness into your 4-H club meetings. A very special Happy Birthday wish to National 4-H Hall of Fame Laureate and Centenarian C. J. Gauger; send him a card! And a Happy Centennial year to all Smith-Lever Act beneficiaries. “Voices of 4-H History” activities in several states and examples of how others are preparing to start History Clubs and/or film alumni, leaders, staff and supporters to capture their stories for posterity. “Hands-On History” focuses on early clothing project demonstrations and fashion reviews as far back as 1919; you can add a historical note to current clothing and fashion-related work by digging into the history of these projects in your area. “VIP Support” introduces you to some of the thousands of noted personalities who have lent their name and prestige to 4-H over the past 100+ years. Celebrities of all sorts – entertainers, sports stars, Presidents and public officials, authors, astronauts and others – provided valuable public awareness to the relevance and impact of the 4-H educational program across the country. Use the Thanksgiving and Holiday breaks to re-group and plan your history activities for 2014. Pumpkin pie and history planning go well together! Ocean City, Maryland – November 22-24, 2013. The Voices of 4-H History Team will be sharing poster displays and workshops for the 2013 Volunteer and Teen Leadership Forum targeted to all faculty, staff, volunteers, and 4-H youth. Th conference focus will be on the 4-H Core Program Components; developing volunteers, strengthening and expanding the 4-H club program. Youth and adult leaders in attendance will be able to launch a Voices of 4-H History initiative or club after attending the workshop. Key components will include: viewing good examples of audio/visual products produced by pilot county sites, recruiting youth and adults, selecting good interviewing questions, good sources of editing software and hardware.